Gerald Coulson has been painting professionally for over 30 years and has a reputation that is second to none. 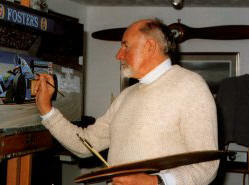 Entirely self taught, he developed his technique to such a high standard that his work was published as fine art prints, enabling him to begin a full time painting career in 1969. Since that time his work, covering many different subjects, has been published and marketed worldwide as both open and limited edition prints. Gerald has had many one-man shows both in the UK and the USA and his work has been extensively exhibited throughout the world. A recent one man show of his in the UK attracted more than 3000 people in two days. The Fine Art Trade Guild have placed him in the top ten best selling artists no less than fifteen times - three times at number one. Coulson’s passion for aircraft stems from childhood. This passion led to an apprenticeship as an aircraft engineer after which he served in the RAF as a technician and with British Airways as an engineer at Heathrow. His knowledge of aircraft engineering, combined with his drawing ability, led to him becoming a Technical Illustrator of service manuals for Civil and Military aircraft. These experiences and technical background have allowed him an insight and intimate knowledge of the aircraft he paints. 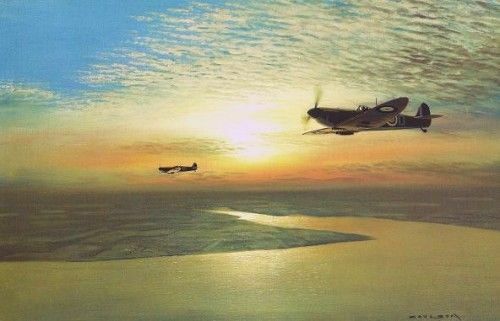 Along with a unique ability to capture these aircraft on canvas this naturally led to a painting career which he has developed to successfully cover a wide variety of subjects. Following a trip to the 1991 British Grand Prix his interest in Motor racing was fuelled. His ability to capture the technical detail and a talent for painting subjects at speed meant that this was a perfect natural progression alongside his aviation work and he is now also firmly established as one of the worlds leading motor racing artists. A Vice President and founder member of the Guild of Aviation Artists he is a four times winner of the Flight International Trophy for outstanding aviation painting. He qualified for his pilots licence in 1960 and is still actively flying today - mostly vintage aircraft, and can often be seen buzzing over the Fens of Cambridgeshire in a Tiger Moth. 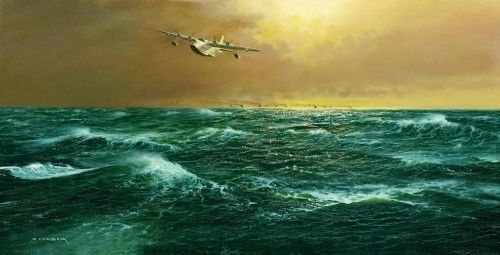 Whatever the subject he paints, whether aviation, landscape or portrait, his unique ability to capture the realism and ‘mood’ of the scene is unsurpassed, making him one of the most widely collected and highly regarded artists in the world today.